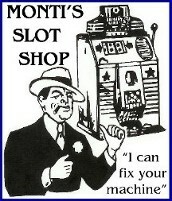 is there a way to check the operation of the jackpot on a Mills high top while the machine is together? Not really, you could take the top off the front and cycle machine. Usually there’s 4 bolts holding the top in place, just remove the mech and pop them out, you will also have to remove the tube the catches coins from overflow to the jackpot if I remember correctly. I assume that you are talking about the Front Jackpot Assembly located on the back/interior side of the lower front casting! you would have to at least remove the mechanism and manually activate the front jackpot trip and reset levers as shown in the picture here below! #1, Trips the main jackpot and releases the main jackpot flap which would allow coins from the main jackpot to spill into the money bowl! Pushing up on #1 would, or should cause the above action! #2, Moving forward on the next handle pull would cause the initial trip lever #1, to reset closing and locking the main jackpot flap and at the same time #3 is pushed forward allowing the reserve jackpot flap to release coins from the reserve jackpot into the main jackpot to refill it! Then on the next handle pull #4 is pushed forward which would reset the reserve jackpot flap with a relatively audible snapping sound as it springs forward! The above would confirm front jackpot operation! All moving parts on the front jackpot would have to be free moving and not gummed up for all the above to occur properly! To confirm the handshake between the mechanism and the front jackpot is a little more difficult when the mechanism is in the cabinet! It can be done, if you know what you are looking for, by shining a small flashlight thru the mechanism under the reels and above and a little left of the clock fan and visually looking at the interact of the trip and reset function but this is only possible if you know the interaction that should take place! The better way is to remove the top casting from the cabinet and look done from above and you would more easily see the action that would take place! Of course all trip and reset levers would have to be present on both the front jackpot and on the payout slide assembly! 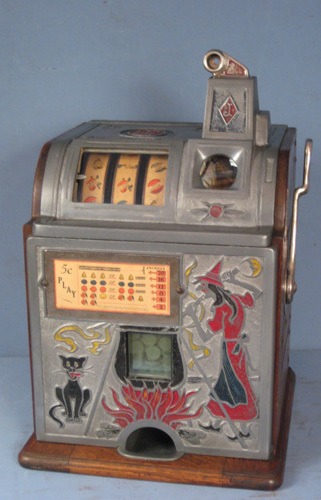 There are a couple different styles of front jackpots as to the type of #1 trip lever that is used and as to the apparatus that is on the payout slide assembly that would interact with it as well but only a picture of your front jackpot and the payout slide assembly would clarify that and mentioning it here now would just be confusing! I hope this helps somewhat but someone else may be able to explain this better! thank you. i will try that. i just want to insure i put everything back together in working condition.